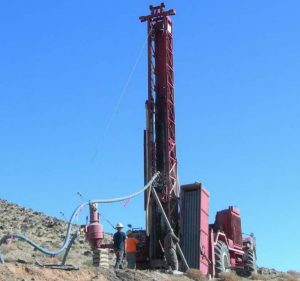 NEVADA – Vancouver-based Victory Metals has expanded its landholdings at the Iron Point vanadium project to 5,382 hectares thanks to the results from recent reverse circulation drilling. The property is about 35 km from Winnemucca. 27 meters grading 0.46% vanadium pentoxide in VM-60. Victory Metals said the latest drill results are consistent with a pair of flat lying high grade horizons – the Upper High Grade and New High Grade zones. These zones occur in a larger low grade envelope that starts at the surface and extends to at least 175 metres. The current 43-101 report about Iron Point is posted at www.VictoryMetals.ca.